I’m not a big fan of Black Friday. I’ve never been one to get up in the morning and take part in a shopping frenzy. In fact, I’m not a fan of early morning at all, so perhaps my aversion to Black Friday reveals that I believe retailers should give me expensive electronics and cash to get me out of bed on a holiday weekend before the sun is shining. That still might not be enough of an incentive to leave my cozy warm bed for vicious crowds and over-the-top consumerism. Here’s what I did instead for Black Friday (after a late brunch, of course). I counted my clothes. I’m taking part in an assignment I also gave my Intro to Sociology students. 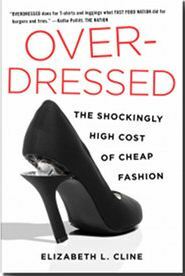 We are reading Elizabeth Cline’s Overdressed: The High Cost of Cheap Fashion, where Cline begins her exploration of the fast fashion industry by counting her own clothes that she had accumulated through years of bargain-hunting. She had 354 items of clothing, most of it cheaply-made fast fashion produced in Asia. In order to not make the clothes-counting task overly burdensome for my students on Thanksgiving weekend, we are only counting our clothes that are currently in circulation – if it’s in a drawer, hanging in a closet, piled on the floor or hiding in a laundry basket, it gets counted. If it’s in a storage bin, it doesn’t get counted. Ditto for underwear, accessories, shoes, scarves, mittens, hats. That means our clothing counts are conservative. Besides just the total count of clothing items, we are also keeping track of what country of origin each item came from, for the sake of appreciating the laborers who made the shirts we wear on our backs. For my own personal interest, I also recorded brand, fiber content, whether I purchased the item locally or from a national retailer, and whether it was vintage or non-vintage. Part of my motivation for giving this assignment over Thanksgiving weekend is I proposed it could be a fun family activity if my students could convince parents, siblings or cousins to help with the count. So with my honey filling out an Excel spreadsheet while I went through drawers, closet, and laundry basket, the count began. The results were interesting. In the spirit of the holiday season, I’ll present my results with pie charts. Pie charts are like little festive Christmas ornaments for sociologists. Feel free to print them, cut them out, and hang them on the tree! 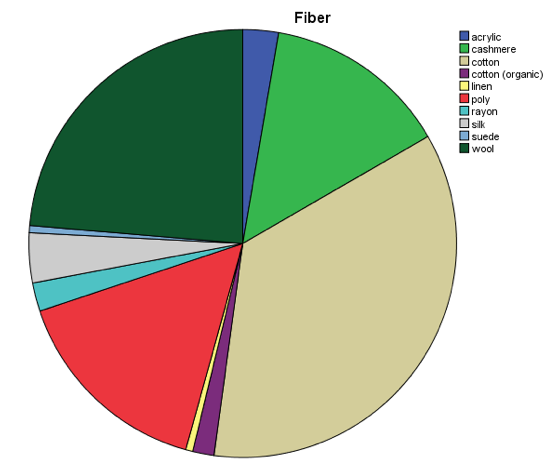 Here is a pie chart illustrating the different types of clothing items in my closet, the grand total of which was 186 items of clothing (and that’s a conservative number, given I didn’t count storage). 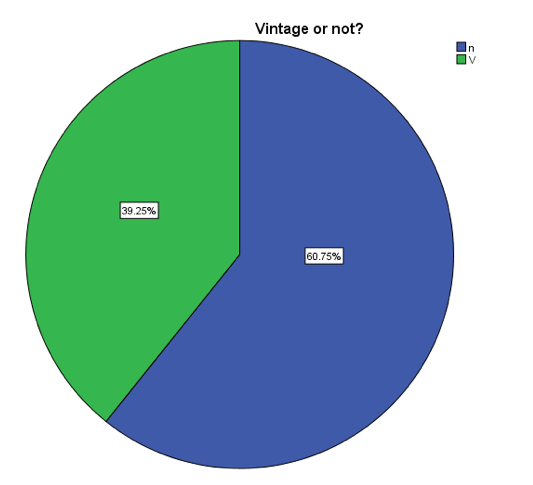 I was curious to see what proportion of my clothes were vintage. I have a passion for vintage, yet my vintage garments have to compete with the many t-shirts, jeans and skirts that form the staples of daily dressing. Indeed, I found that the non-vintage items dominated my wardrobe. 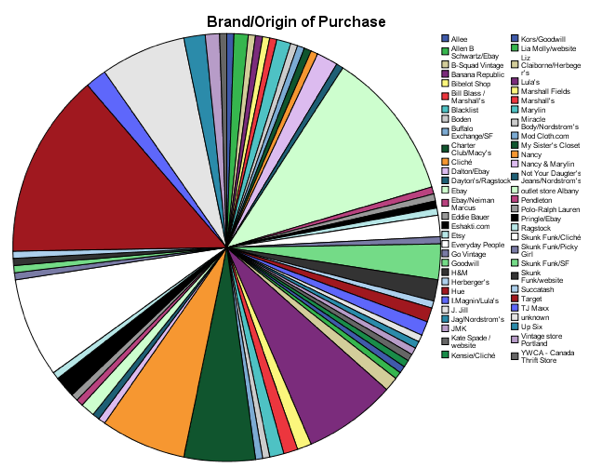 A breakdown of my closet by brand and/or origin of purchase reveals why non-vintage makes up the largest proportion of my closet (by the way, this would be the prettiest of the festive pie-chart Christmas ornaments if I were judging purely on an aesthetic basis). 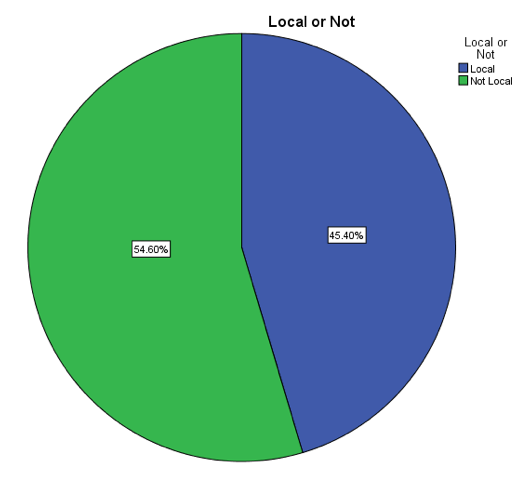 I also checked the proportion of garments I had purchases locally, in non-chain shops. I thought my results were respectable, though non-local purchases did dominate. 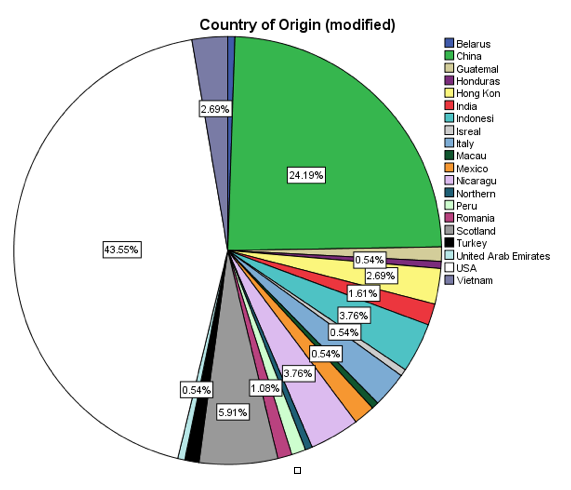 What I found most interesting was the breakdown of my wardrobe by country of origin. 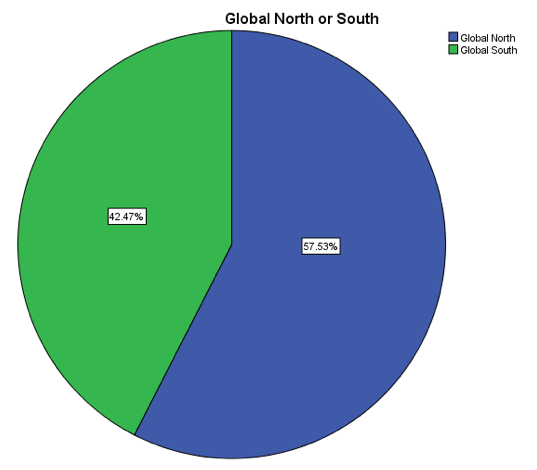 The largest proportion of my clothes were made in the U.S.A., followed by China, and Scotland (huh, Scotland? Yes, Scotland).This is where my wardrobe tells a story about the U.S. fashion industry that Cline details in her book. The high proportion of USA-made items in my closet mostly comes from garments that were made before 1990. 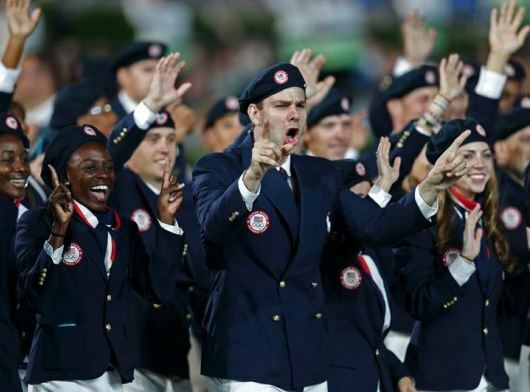 Combined with new clothes I sewed, and a few pairs of USA-made jeans and leggings, this explains the strong showing for USA. Made before 1990 also explains the curious position of Scotland in third place. I live in a cold place, and I have a thing for vintage cashmere sweaters, almost all of which were originally made in Scotland. I’ll be curious to see what the results of my students are for this same exercise. I am guessing that China and other Asian countries will account for a larger proportion of clothing in their closets. And I am sure it will generate a discussion about the labor conditions in the countries where most of our clothing is produced, as this is an compelling theme in Cline’s Overdressed. And I also hope that by counting clothes over Thanksgiving weekend, everyone felt thankful for what they had and maybe Black Friday held less enticement than in previous years. 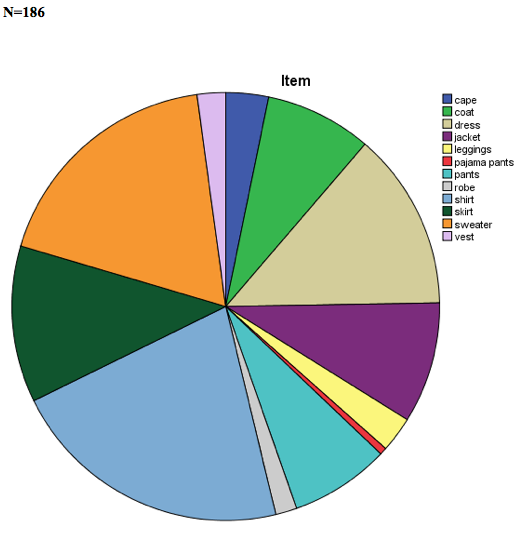 All pie charts created on SPSS by Lars D. Christiansen. Thanks! 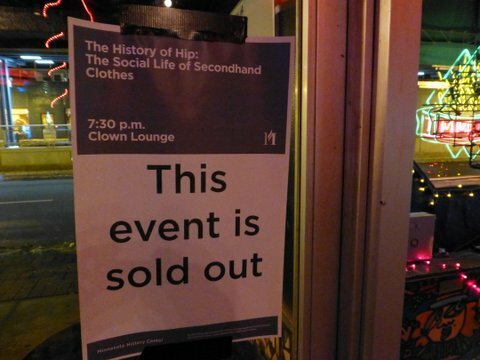 On a rather temperate Tuesday night (for January in Saint Paul), the Clown Lounge at the Turf Club was filled with a fashionable audience interested in hearing about vintage clothing. 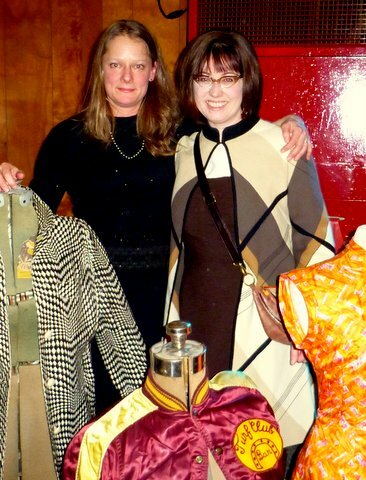 As part of the Minnesota Historical Society’s History of Hip Series, Hayley Bush (owner of Lula Vintage) and I talked about how vintage style became a trend, and how the vintage clothing business has changed over time. Since the event sold out (thanks to the great publicity from the City Pages A-list and Vita’mn), I thought I’d give a brief recap of a fun and engaging night at the Turf Club. We started out the evening by talking about the difference between clothing that is secondhand, vintage and retro. Although these are categories that overlap in popular usage, there are useful reasons to make distinctions between them. When most people say “secondhand clothing,” they are probably thinking about contemporary clothes (just a few years old) that happened to have been previously used. Vintage garments are a type of secondhand clothing, but they are usually 25 years old or more and have a definite look that suggests, stylistically, an earlier decade. Retro clothing is usually new clothing that looks vintage – like mod dresses with peter pan collars from Mod Cloth or the fab 50s dresses from Bettie Page. Since this was a history talk, I discussed the history of wearing secondhand clothing and how wearing vintage eventually moves from being a counter-cultural fashion statement to mainstream street style. The idea that secondhand clothing was only a sign of poverty was challenged in the 1950s, as various subcultural groups started using anachronistic looks to sartorially distinguish themselves and to provide a visual critique of mainstream American consumerist values. The Beatniks of the 1950s and 1960s, the Hippies and Yippies of the 1960s and 1970s and the Punks in the 1970s and 1980s all used clothing that was recognizable from the past, like Hippies’ Edwardian coats or Punks wearing ripped 1950s tulle petticoats as skirts. [See Tove Hermanson’s insightful post “Poverty and Power: Secondhand Clothes as Protest” on her blog Thread for Thought for a more thorough description]. The decades when anachronistic, thrifted looks were associated with protest made me wonder: When did wearing decades-old secondhand clothing move to the mainstream? The short answer to my research question is that in the late 1970s, mainstream fashion magazines began to feature photo spreads and small articles about wearing vintage, though they didn’t refer to it as “vintage” in the beginning. The long answer will require a future post! It was at this point in the evening that I announced that the next phase of my research will involve a survey of vintage clothing wearers about why they wear vintage clothes. What does it mean to us when we put on a dress that’s 20+ years old? Stay tuned for that – I’ll be posting a link to the survey on this site soon. Hayley Bush then swung into action, talking about how she entered the vintage clothing business. Lula Vintage, which is celebrating its 20th anniversary this year. Hayley talked about how she got started in the vintage retail business and what changes she has seen since Lula opened. Wearing vintage clothing must have taken a little while to catch on in the Twin Cities. When Hayley first opened, people would come into the store, look around, and ask, “Do people buy things here?” Fortunately, the answer was yes, and Lula became a Twin Cities go-to for vintage apparel. In terms of trends in the vintage clothing business, Hayley regularly witnesses how television shows and film shape what customers want to see in the store. Downton Abbey and Gangster Squad lead to requests for clothing from the 1920s, and Mad Men for the 1950s and 1960s. During a lively Q & A, the topic of “heritage wear” and whether the recent interest in high-quality USA-made menswear has a relationship to vintage clothing. In case you haven’t heard of heritage wear, I think of “heritage wear” as sturdy, classically-styled clothing and footwear made in the United States, like Levi’s Made in the USA line, scarves from Faribault Woolen Mills, or boots from Redwing Shoes. You can spend a pretty penny for contemporary clothing that is made in the U.S., so that means those who like the trend are also seeking the older versions in the vintage shops. For more information, see my previous post on menswear. 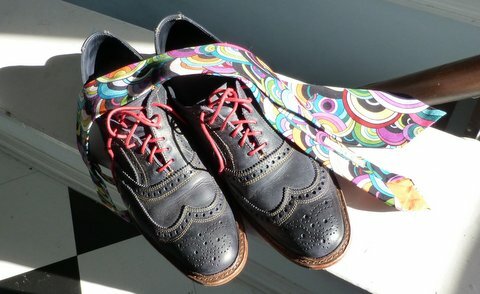 Other changes in the clothing industry are helping vintage remain a trend. Both Hayley and I discussed how the quality of contemporary clothing is changing in terms of whether natural fibers (cotton, wool, silk) are used and whether a garment in constructed in a way that allows for years of use and re-use. When a new shirt has a gap at the seams after a couple of washings or a new winter coat pills after two months, it is an incentive to see what’s “new” at the vintage shop. Thus, there are many reasons that people seek vintage clothes and visit the many great shops like Lula. I was honored to be with Hayley for 2013’s first installment of the History of Hip series at the Turf Club. 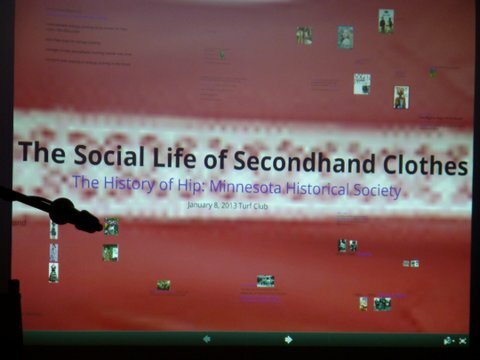 A big thanks the Minnesota Historical Society’s Aleah Vinnick for making all the arrangements. Please check out the next installment of the History of Hip series is “The New Nordic?” featuring food blogger Patrice Johnson and Fika’s Michael Fitzgerald’s (the new restaurant at The American Swedish Institute) talking about the resurgence in popularity of Nordic cuisine. The event is again at the Turf Club on Tuesday Feb. 5 from 7:30 to 9:00pm; purchase the $5 tickets from the MNHS website before they sell out!